I love roller coasters and yet I don’t like heights. 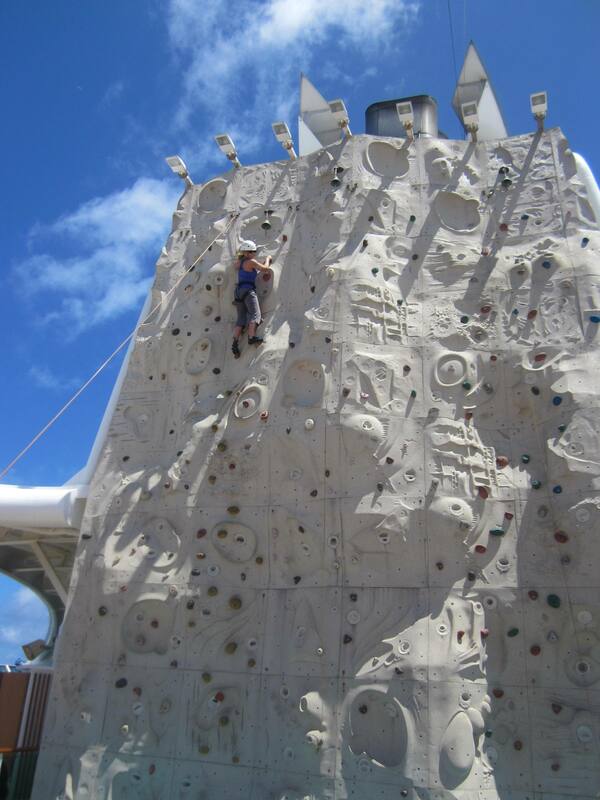 However, I signed up for rock climbing because I thought it would be good to face my fear. You sign a waiver before you can do it and then they fit you out with special shoes, a helmet and a safety harness fitted around your bottom, so it’s not like you’re just climbing up a cliff face on your own. That’s what I told myself as I entered the arena. 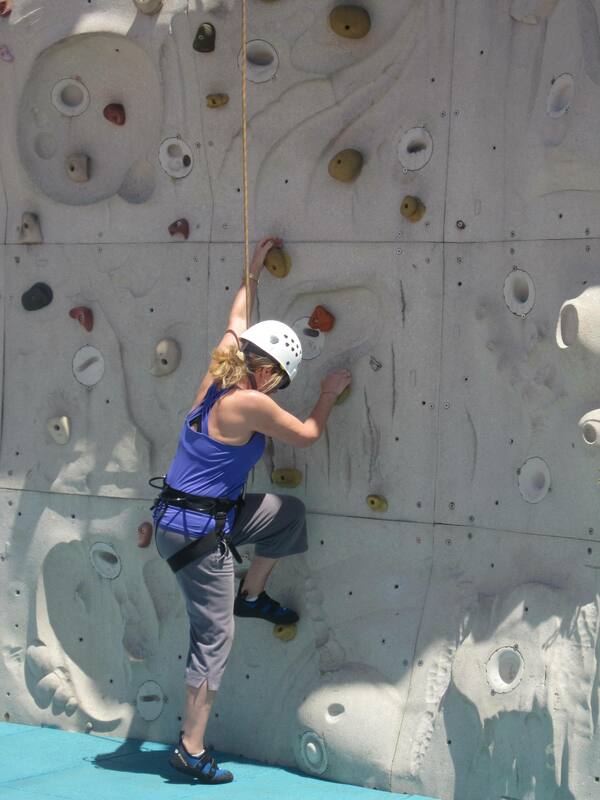 A rope is attached to the harness, and then you start climbing the wall. There were many different coloured rocks and I was told to go for the yellow ones, which were possibly for the virgin rock climbers. The female attendant talks you through as you make your way upwards, giving hints as to where to put your foot or hand next. Because I am not particularly tall, a couple of the yellow rocks were a little out of my reach, so I had to grab a different colour. If I ever went real rock climbing, which I doubt, I would be looking for the colour coded rocks and I would be sadly disappointed! I tried to focus on what I was doing, rather than where I was, but the adrenalin was coursing through my veins. At one stage I was almost ready to give up, but I persevered, and when I finally made it to the top and rang the bell, I was simultaneously relieved and exhausted. Then it was time for the procedure of descent. I was told to hold the rope with both hands, but that meant I had to let go of my handhold. I prised my fingers away and managed to grab the lifeline, and then I abseiled down the wall, just like that. Well, not quite, as I had to get used to putting my feet out to connect with the wall as I came down. It was a little awkward but I made it. When I got to the bottom my knees were shaking and I had to immediately lie down on the ground to celebrate. Part of me thinks once was enough, but another part of me wants to do it again, only better. There is no rule that says I have to or don’t have to, so I’ll see how I feel later on the cruise. Stay tuned. Postscript: I decided once was enough! I have never sung with a band before, so here was an opportunity. After the evening show, Mick and Sandy accompanied us to the Colony Club, just past the pool tables on Level 6, where the Millionaire game was just finishing. 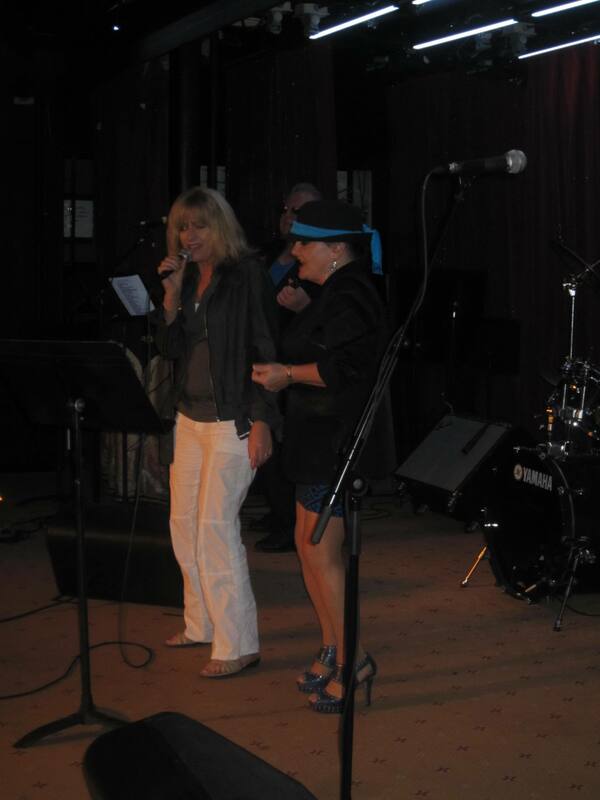 The show was introduced by Jamie, who also runs the karaoke, but she was dressed up and in character as Trina Turner, Tina’s forgotten sister! There were almost two dozen songs from which to choose, and fortunately there were a couple we knew. Dutchy was second up, with 867-5309 Jenny, and he did really well, and then I was third. 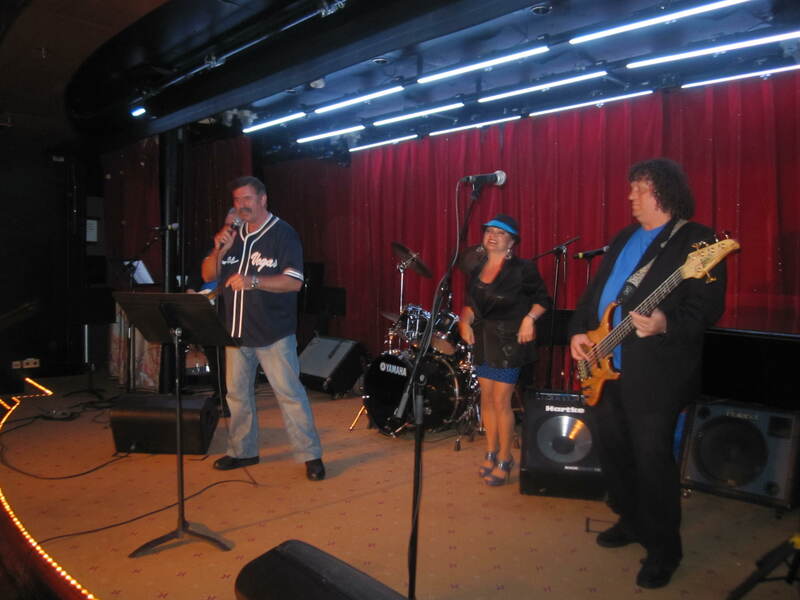 We had been given the written lyrics, but I hadn’t brought my reading glasses up on stage with me, so the girl in the Zig Zag Band, little Trish, was helping decipher them for me. I should really have known These Boots are made for Walking off by heart, but the new experience of being up there with a band (which I loved by the way!) distracted me. 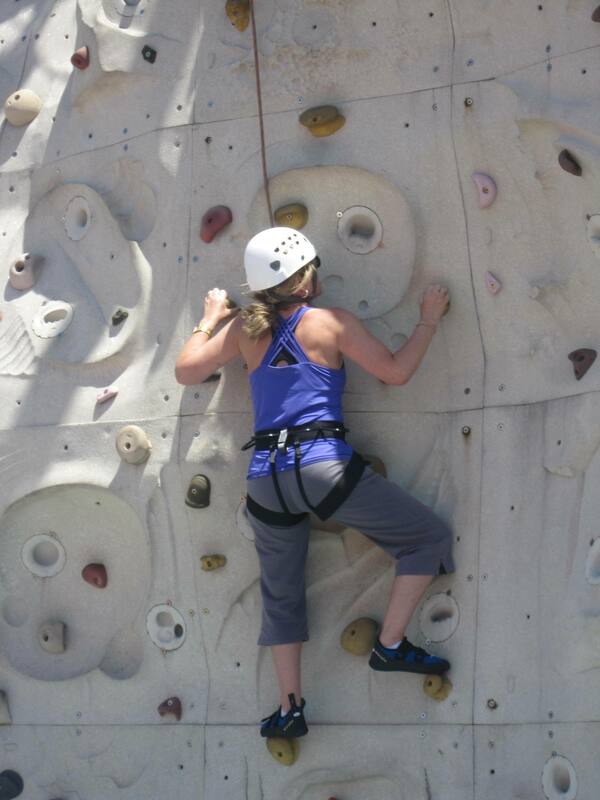 Not only that, I think I was still recovering from the rock climbing experience earlier in the day. The cocktail we had each consumed had nothing to do with it. We had time to do another number, with Dutchy singing The Joker and I sang My Guy, and we were both a lot more comfortable with the second song. Excited by the whole situation, we lashed out and had another cocktail. Each day there is a special cocktail, and they cost between $8 – $10. For an extra $2.75 you can purchase the souvenir cocktail glass. We really liked them, so by the end of the cruise we planned to collect a set of eight, which would not be onerous, though the packing would almost certainly be a challenge. …unless you win. Most of the group of Novacastrians, our friends from Newcastle, went to Bingo, where they had a two-for-one day. So for $32 we each got to play four games, which I found rather tedious. Would it have been so tiring had I won? Probably not, but the irony of it was that Dutchy had let our friend Sandy in ahead of us, so when she yelled out BINGO it occurred to us that it could have been us winning $379. C’est la vie. Karma has a way of working out, so maybe Dutchy has something good in store. Sandy shouted drinks all round anyway, and then at another Bingo session Chris won $290, so drinks were shouted again. I preferred playing roulette, although I had no such luck as I did in Las Vegas, so it wasn’t as much fun. If you haven’t already worked it out, I find things a lot more fun if and when I win! 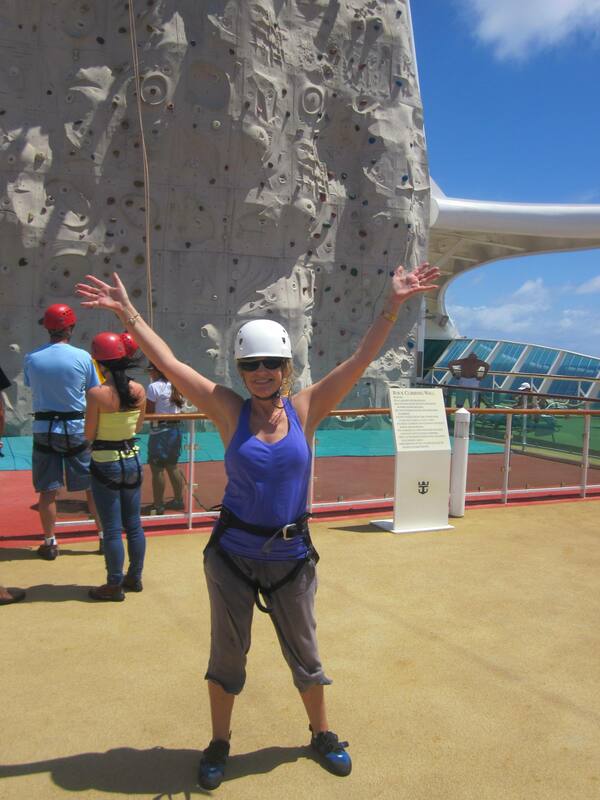 This entry was posted in Royal Caribbean International Cruise and tagged bingo, cruise activities, first time, radiance of the seas, rock climbing, rock-a-rokie, Royal Caribbean, sing with the band. Bookmark the permalink. Good to see you are both having such a good trip.